I have done a lot of study on brain-based learning over the last few years. I've experimented with some techniques in the classroom that have reaped many benefits, but I think I may have stumbled upon a new approach to integrating some BBL through the use of the iPads...and it involves Keynote...yes, Keynote and I'm not talking merely creating a slideshow presentation! We are currently wrapping up a chapter of content and it's time to prepare for our test. Our goal is simple...create a Keynote presentation of review material that contains visuals representing the information that needs to be learned for the test. We've talked a little about the importance of the organization of the information, as well as the font and formatting of the slides and how they can enhance the learning of this material. I even came across an interesting blog called The Keynote Classroom and I uncovered a lot of interesting tips and techniques as well as some great inspiration. 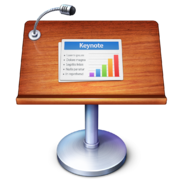 I just didn't realize how powerful this little app could be...way beyond just building a presentation. So we are ready to take test prep to the next level. It will be interesting to see how this turns out...stay tuned. 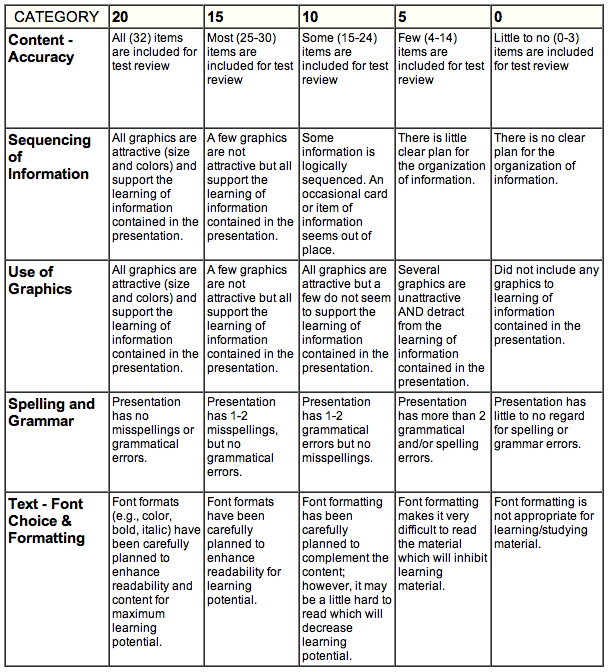 Below I've included the rubric for this project. Well, our iPads finally arrived yesterday! It was a much anticipated event and my students were thrilled. Over the next several months, I'm going to be blogging about our experiences, my observations, and the impact they are having on our learning environment...whether or not they are transforming our work and if so, specifically how. Our first task was to create a collage featuring pictures of the students who would be sharing each of the iPads along with the number assigned to each iPad. This collage would become the wallpaper for each device. We also had to get the apps that had been selected onto the devices and get the docks aligned with the apps we would be using most: Evernote Safari, Google Chrome, Google Search, and Dropbox. We wanted to make sure we could hit the ground running and it gave us an opportunity to explore some of the apps we would be using! While these devices appear to be shiny new toys we get to use in our classroom, by day two, a significant difference emerged! They provided an opportunity for me to differentiate instruction and allowed me to meet the individual needs of my students. Case in point...one of the standards the state of Texas requires of 7th grade social studies students is to examine and analyze primary source documents. Because we are a BYOD district, this year we have been using the app, Evernote for our history notes, an online version of our usual "Interactive Notebooks". Using Evernote, I recreated a newspaper article about Texas that appeared in a Philadelphia newspaper in 1835 talking about the opportunities Texas held for those who were willing to take a chance. Students were to read the article, answer some questions about its contents, and find a picture that reflected the essence of this article. Sometimes it's difficult for students to read primary source documents because the language is often archaic and cumbersome. This app allowed me to record myself reading the article so, if the students needed help in reading this document, they could simply press the play button and read along as I read the article to them. If they didn't need the additional help, they didn't need to bother with that, and could proceed on to the questions and activity at the end. I can already tell these devices are going to be a great tool for allowing the students to be active learners that dictate exactly what they need to learn better, learn deeper, and have information on demand at their fingertips! They will also provide me with the opportunity to deliver the resources needed to meet the individual needs of all of my students. So, one of the main observations I will be making over the next several months is whether these devices actually transform learning, and if they do, then how...On day two, this was a very easy observation to make. In the past, to provide access to a lengthy reading passage for all of my students, required that I personally read that passage. While this was adequate help, the students could never "stop my play button and rewind me if they missed something!" These devices provided an opportunity for students to have access to this additional help on demand as needed. Gotta love technology! understand the environment needed for piloting an initiative. understand the importance of experimentation and evaluation. understand the vital necessity of developing "best practices". File-naming conventions that were best to use. Easiest ways to share documents. 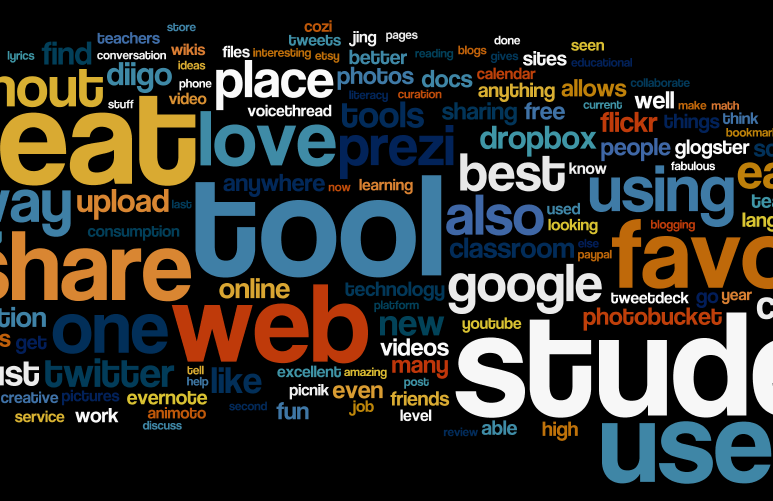 Best ways to organize Google Drive. Best ways to organize and manage Gmail. Understanding the importance of creating an environment that is experimental in nature is critical to any pilot program. Mistakes pave the way to success. The students loved being a part of that and understood their opinions were important. I had some real leaders emerge as trailblazers and many had never really experienced this kind of success or recognition. It's exciting to see students take ownership in their learning and find value in helping others learn as well. We are about to implement a 1:1 iPad pilot and I am depending on my 1st period class to step up to the plate once again. They are up for the challenge and I know they will be instrumental in developing "best practices" for those who follow. We are looking forward to the delivery of our new iPads...hurry! We're ready!